All Souls was built at the heart of the University of Oxford, on the corner of High Street and Catte Street. It stands next to the 'University Church' of St Mary the Virgin, in which the University's self-governing 'Congregation' once met. The foundations were laid in 1438, and the College's High Street front today gives a good idea of how the main part of the original College looked. The four-storey gate tower and the two-storey ranges either side of it remain essentially as built in the 1440s, although the range to the east was extended in the sixteenth century, when battlements were added all the way along, and the windows are Victorian. Pass through the gate house and you again see an essentially medieval building. Here lived the Warden (in rooms beside the gatehouse); the forty Fellows, who until the eighteenth century shared sleeping quarters (still indicated by the wider 'two-lighted' windows), but had individual studies (the narrower, 'single-light' windows); and a number of chaplains, choristers, clerks, and servants. Today the quadrangle still houses Fellows' bedrooms (now individual) and studies, as well as administrative offices. The Chapel takes up the whole north side of the quadrangle. The vestibule of the Chapel. The modest entrance gives little hint of the lofty Gothic interior which greets the visitor. Fifteenth-century fan vaulting in the Chapel vestibule. A view of the antechapel from the south door. The Chapel, designed in the 'perpendicular' Gothic style much favoured in England at the time, was built in the shape of an inverted 'T': that is, it has a chancel, to the right in the picture, and transepts, which form the antechapel, but no nave. The spacious antechapel would, before the Reformation, have included six side-altars. The Chapel still retains its original medieval hammer-beam roof, which together with the gilded wooden angels that adorn the ends of the beams dates from the fifteenth century. The angels owe their current brilliance to a late twentieth century regilding. Most of the antechapel windows contain some fifteenth-century stained glass. These are three holy women on the east wall, to the south of the screen: Saint Maria, Saint Helena, and Saint Anastasia. The baroque Chapel screen, designed by Sir James Thornhill in 1716, and restored and gilded in the late twentieth century. It replaced a screen which was attributed to Christopher Wren. The reredos of the Chapel dates from c. 1447. Its niches contain statues of saints, bishops, and monarchs, arranged in rows on either side of a Crucifixion scene, just above the altar, and a Last Judgement, high up under the roof. The original statues, destroyed in the sixteenth century Reformation, were not replaced with the present Gothic imitations until the nineteenth century. Detail of the medieval reredos with its modern statues. Traces of the original medieval colouring are just visible in the niches behind some of the figures. Shown here are (left to right) Thomas, Duke of Clarence; Humphrey, Duke of Gloucester; an archer; and Thomas Montacute, Earl of Salisbury. The Chapel is noted for its complete set of original fifteenth century misericords, which still lurk under the wooden seats of the Fellows' stalls in the chancel. Among the 42 carvings are many lively, grotesque, and fantastic figures; this example, more sedate, shows a crowned swan. The upper floor of the further right-hand side of the front quadrangle (as seen from the gatehouse) is occupied by the Old Library. Bookcases once projected out into the room, set at right angles to the walls. The elaborate plaster work on the ceiling dates from 1598. The room is used today for lectures, seminars, and meetings. Detail of the Old Library ceiling plaster work. The gatehouse and front range, viewed from the north (Chapel) end of the quadrangle. The College's Warden originally lived in rooms to the left of the tower. This aerial-view drawing, known as the Typus Collegii, dates from around 1600. It is the oldest surviving representation of the original medieval and Tudor All Souls. It shows the front quadrangle, with the Hall projecting from its north-eastern corner at right angles to the Chapel, and the Warden's house and garden, as well as various outbuildings, a cloister (begun in the 1490s), and kitchens. The Warden of the College had lived in a house at the east end of the High Street front from the middle of the sixteenth century. In 1703, however, Dr George Clarke, a fellow in public service with strong architectural interests, proposed that he should build a house for himself on College ground at his own expense, and that it would revert to the College on his death. The house he built, which became the Warden's lodgings, originally boasted battlements to harmonise with the rest of the High Street front. The more classical, Palladian facade to be seen now dates from the 1820s. Entering the College through the smaller gates on the High Street, the Warden's house and garden can be seen to the right, and ahead, north of the kitchen quadrangle, the dining hall. Unlike the medieval hall that it replaced, the present hall continues the east-west axis of the Chapel. It was built as part of the great refashioning of the northern end of the College undertaken by the great architect Nicholas Hawksmoor (1661-1736), which, along with the creation of Radcliffe Square and its library, would transform the architectural centre of Oxford. After considering several plans in various styles from several architects, including Hawksmoor, the College eventually agreed on Hawksmoor's own idiosyncratic version of Gothic. This would harmonise with the north range of the medieval quadrangle (which the Fellows would eventually, for lack of funds, decide not to demolish). The plans would also accommodate the new library that was to be built from the spectacular bequest of Christopher Codrington. Designs were broadly approved in 1715-16, but the hall as we see it, on the outside a mirror image of the Chapel, was not built until 1730-33. Hawksmoor's rebuilding of the college was financed not from capital or revenue, but from benefactions by some of the wealthier fellows. In commemoration, their coats of arms are displayed in this cartouche, located between two of the Gothic pinnacles that surmount the hall's south range. The inside of the hall presents a striking contrast to its Gothic exterior. The restrained baroque of its ribbed plaster vaulting is virtually unparalleled in English architecture of the period. The windows that on the outside are framed by pointed arches are in fact round-headed. The oval Buttery, where the Fellows now eat lunch, is unique in its conception, which must be Hawksmoor's, although no designs for it survive. Its coffered ceiling is an ingenious combination of dome shapes. 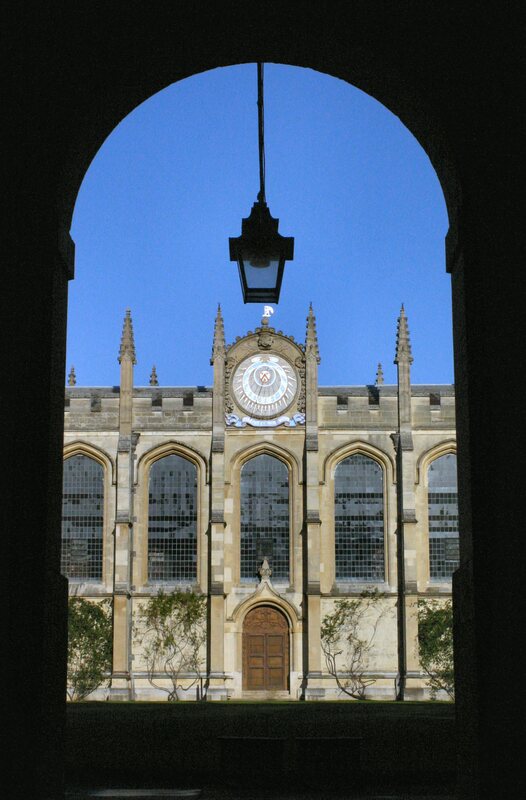 Hawksmoor's major achievement in rebuilding the College was the North Quadrangle, which faces Radcliffe Square, and so orientates this part of the College east-west, as against the north-south axis of the front quad. The Codrington Library to the north, begun in 1716, is seen here through the passageway that runs between Chapel and hall. Its Gothic pinnacles precisely match those of the south range opposite, and the quadrangle as a whole is classically symmetrical. The central accent of the sundial, the design of which is attributed to Christopher Wren, was absent in the eighteenth century. Moved to its present position only in Victorian times, it was placed initially between the south-facing pinnacles of the chapel. The western side of the north quadrangle, facing out onto Radcliffe Square, is marked by a cloister. This is not a medieval-type cloister, although one had existed on this Catte Street front of the College since the late Middle Ages. Rather, the present cloister is a single arcade, open to the interior of the quadrangle and linking the Chapel and the Library. It is enhanced by a central gateway and cupola. Facing Radcliffe Square is the eastern side of Hawksmoor's quadrangle, the 'grand dormitory' of Fellows' rooms, with common rooms on the ground floor. The three-storey facade is broken by the extraordinary twin towers, as if the west front of a medieval cathedral had been dropped into an Oxford college. As Sir Howard Colvin put it, 'Gothic used scenically and romantically, but within the conventions of a classical tradition...a unique episode in English architecture'.